The most popular countries for Americans vacationing in Europe are the United Kingdom, France, and Italy. I’ve always wondered why Germany isn’t higher on the list. Perhaps it’s because of the flawed notions that the weather is too cold and that Germans are stern and humorless. This couldn’t be further from the truth. While Germany’s temperate months are limited, spring, summer, and early fall are all wonderful times to visit. And Germans are incredibly warm: In my frequent travels, I have always found them easy to meet and befriend. Many Germans speak flawless English and have a genuine liking for Americans. I suggest getting to know Germany by starting in Munich, the country’s third largest city. Cosmopolitan and sophisticated, Munich is exceptionally clean (just try the subway, or U-Bahn) and known for its beautiful old town, vibrant cultural scene, and distinctly fashionable populace. While I have visited Munich many times, this September marked my first trip to Oktoberfest. Even though I’m not a huge beer lover, didn’t own lederhosen (I do now), and usually avoid large, crowded events, I decided to try it anyway (my friends persisted); it turned out to be one of the best festivals I have ever attended. No one I asked seemed to know why Oktoberfest starts in September and runs through the first weekend of October. But one theory suggests that the initial weekend of October became so popular that the government decided to start the parties earlier and earlier. It’s definitely more fun to go with a group of friends or family. Be sure to reserve tickets well in advance. 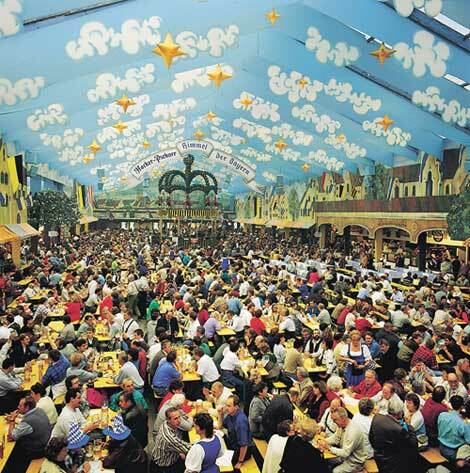 I was surprised by the enormity of Oktoberfest—14 huge tents, most holding more than 5,000 people—and that I could drink six large steins of beer without falling down! The festival has traditional German entertainment (think oompah bands), very good and hearty food (including Weisswurst, a veal and pork sausage, roasted meats, potato salad, sauerkraut, pretzels, and much more). Many dress in traditional lederhosen (buy your own for less than 100 euros), and kids enjoy the carnival rides. After 7 hours of dancing, eating, singing, and drinking (beer and more beer), you’ll need to rest. Since the U-Bahn is liable to be mobbed and taxis tend to be in short supply, hire a pedicab or ask your hotel for a pickup. My favorite place to stay for a smart splurge is the centrally located, comfortable, 70-room Mandarin Oriental Munich (from $542/night). The Königshof (from $371/night) features classic Continental-style decor (gold, brass, chintz). For a good value option, try the Anna Hotel (from $254/night) or the Cortiina Hotel (from $227/night). Munich is an ideal walking city with lovely cafés, charming architecture, and luxe boutiques. There are many high-end shops on Maximilianstrasse, but my favorite store for well-priced men’s clothing with European flair is Hirmer (Kaufi nger Strasse 28). To get a sense of the city, spend a day biking around town (hotels can arrange rentals), or take a bus tour. Be sure to see the famed English Garden, the city’s main park; while there, stop by the park’s beer gardens, such as the See House or Chinese Tower. Explore the Frauenkirche, a huge cathedral dating from the 15th and 16th centuries. The Marienplatz is a central square where the town hall is located. Stroll the surrounding old town streets and stop at the Viktualienmarkt to sample some local fare. Try the fresh herring; it’s one of my favorite dishes. Nearby is the Munich Jewish Museum (St.-Jakobs-Platz 16), which is well worth a visit so as to appreciate 400 years of Munich’s Jewish history, art, and culture. For the very best cuisine in Munich, head to the Königshof’s restaurant (Karlsplatz 25, tasting menus from $124), known to be the city’s best, or Tantris (Johann-Fichte-Strasse 7; prices à la carte) for nouvelle cuisine amid a modern decor. Other favorites include the contemporary Seven Fish (Gärtnerplatz 6; entrées from $7), the lively Brenner (Maximilianstrasse 15; entrées from $11), and the traditional Bavarian restaurant Pfistermu?hle (Pfi sterstrasse 4; entrées from $16). After dinner, head to the Schwabing neighborhood for pleasant outdoor cafés and vibrant nightlife. Munich is perfectly located for train hops to Salzburg, the Alps, or a bit further afield to Prague or Vienna—assuming you don’t have an Oktoberfest hangover!